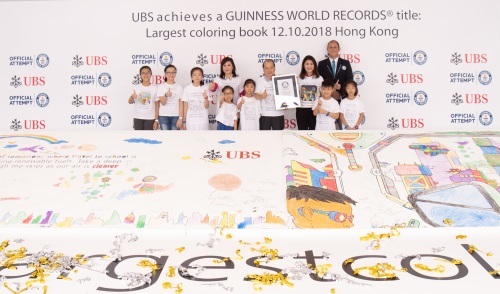 - UBS teams up with over 500 children to create the world's Largest coloring book titled "Coloring the Future of Hong Kong"
- Concurrently, the annual UBS Hong Kong Philanthropy Fair is held, with a panel discussion themed "The Colors of Giving: From Passion to Action"
HONG KONG, Oct 12, 2018 - (ACN Newswire) - UBS presented the Mega Art Project - creating the world's Largest coloring book (the "Project") - today at the Central Harbourfront in Hong Kong, setting a GUINNESS WORLD RECORDSTM title for the 'Largest coloring book'. The pictures in the 14-meter long giant coloring book "Coloring the Future of Hong Kong" were designed by a group of seven primary school student artists, and coloured by over 500 children from the local charity Po Leung Kuk as well as members of the public . The opening of the Project was officiated by The Hon. Matthew Cheung Kin-chung, GBM, GBS, JP, Chief Secretary for Administration of the Hong Kong Special Administrative Region (HKSAR) Government, Amy Lo, Chairman and Head of Greater China, UBS Wealth Management and Country Head, UBS Hong Kong branch, and Dr. Margaret Choi, Chairman of Po Leung Kuk. John Garland, the official adjudicator from Guinness World Records, announced the new world record had been set at 2:30pm today. The Chief Secretary, Mr Matthew Cheung Kin-chung, expressed his gratitude to UBS for organising the UBS Mega Art Project and showcasing the creativity of Hong Kong children through paper and crayons under the theme of "Future Hong Kong: imagining tomorrow's Hong Kong today". He stressed that children's growth and development ranked high on the policy agenda of the current-term HKSAR Government. An on-going, action-oriented and high-level Commission on Children has been set up under his chairmanship to strengthen Government's efforts and cross-sectoral collaboration in ensuring children's healthy growth and development in Hong Kong. The Mega Art Project is one of UBS's many initiatives to support art development in Hong Kong. Besides welcoming the public to color in the giant coloring book, UBS also invited community affairs partners and guests to join a number of art activities at the event. UBS has a history of supporting culture endeavours around the world, bringing together ideas and inspiration for the community, through art. "We are delighted to be able to set a new world record together with the HKSAR government and Po Leung Kuk, marking a 'colorful' milestone for Hong Kong. UBS believes in the power of the arts, which can present fresh perspectives, inspire new ideas and bring all in the community closer together. The coming together of many young, bright minds and small artistic fingers has made this project possible and, through their eyes, we can see the Hong Kong they wish to build as they grow up. And from that we know the future of our city is in good hands," said Amy Lo. The giant coloring book features the drawings of seven students, six of whom were winners of the UBS and PLK Mega Art Competition. The seventh student is the child of a UBS staff member, whose artwork was selected by the coloring book's editor, Color My World. Local artist Samantha Li was also involved in the artwork selection process. The coloring book was edited by Hong Kong-based Swedish illustrator Andreas von Buddenbrock, who also gave illustration courses to children at the Mega Art event today. Dr. Margaret Choi said, "Our children were extremely excited and proud to take part in this Mega Art Project. Through art, young people not only learn to appreciate aesthetic values, but also to see the world from different perspectives, to let their imagination roam, to challenge the status quo and express themselves. Our children are fortunate to have an environment which supports them explore art." At the same venue today and complementing the Mega Art Project, UBS held its annual UBS Hong Kong Philanthropy Fair, which included a panel discussion themed "The Colors of Giving: From Passion to Action". The event was joined by more than 40 non-governmental organizations and more than 1,000 clients, staff and students. The Fair served as a platform for people to learn about the dedicated causes of different NGOs and allowed visitors to explore the interesting and meaningful volunteer projects through which philanthropists may make a positive impact on the local community. UBS will continue to contribute to creating a better Hong Kong by giving to and volunteering in the local community. UBS remains a steadfast supporter of arts development in the city. UBS has a long and substantial record of contemporary art patronage. At the core of this commitment is the UBS Art Collection, one of the world's largest and most important corporate art collections, with more than 30,000 artworks. The firm actively enables clients and audiences to participate in the international conversation about art through its global lead partnership with Art Basel, its partnership with Taipei Dangdai, and with leading museums around the world including the Fondation Beyeler in Switzerland, the Louisiana Museum of Modern Art in Denmark, the Deichtorhallen in Hamburg, Museo del Palacio de Bellas Artes in Mexico City and the Art Gallery of New South Wales in Sydney, Australia. UBS provides its clients with insight into collecting and the art market and co-publishes the Art Basel and UBS Global Art Market Report. The firm shares its passion for art and collecting with a global community, and recently established the UBS Art Collectors Circle, to connect collectors and cultural philanthropists who are passionate about art, to share knowledge and best practice. For more information about UBS's commitment to contemporary art, visit ubs.com/art.